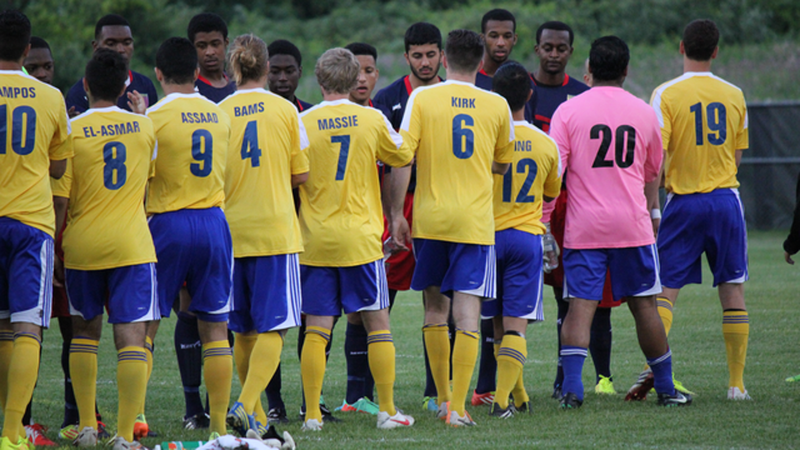 It was truly a case of a tale of two halves Friday in Pickering as Durham United overcame a 1-0 score line at half to defeat Kingston 4-1. Kingston could have had a much greater lead going into the break. The visitors pestered Durham keeper Eugene Alves with several point blank shots, but he had a phenomenal game to keep Durham in. It was primarily a height advantage that Kingston utilized in the first half to gain the territorial advantage. Cross after cross was causing all kinds of difficulty in the Durham box. It was one such cross that gave the visitors the lead in the twenty-sixth minute. Maxime El-Asmar drove the ball deep down the Durham left flank. From the baseline, he crossed into traffic. Durham couldn't control and it fell to a wide-open Dylan Kirk on the penalty spot. Alves had no chance. That would be all the scoring for the half, with Alves coming up with several great saves. The second half started well for Kingston. However, as the old adage says, goals change games and that's exactly what happened in the fifty-ninth minute. A harmless ball into the box caused all sorts of confusion. Two Kingston defenders stood flat-footed as La Shaun Young split the defence to fire from close range to draw the game even. Kingston unraveled with players being heard to loudly argue with one another and with the referee. Having controlled the game up until then, it was a startling turn about. The winning goal came in the sixty-sixth minute. Once again it was a defensive breakdown that allowed David James to sweep in to collect a rebound off a fairly harmless shot and to tap it home. Kingston seemingly stopped playing to allow the play to develop. The bleeding continued. James had his second when he collected a ball that had initially deflected off a Kingston defender, and put it in the top corner from eighteen yards. The final goal came in the eighty-sixth, when Martinho Dumevski showed a nice bit of pace to get behind the defensive line and chip past the charging keeper.